BOISE, Idaho -- Environmental groups are asking a federal court to halt 11 infrastructure projects on four lower Snake River hydropower projects in Washington state that could ultimately see the dams at the projects removed if a pending review determines the dams need to come out to help salmon. The 45-page notice filed late Monday, Jan. 9 in Portland, Ore., estimates the cost of the projects at US$110 million. The National Wildlife Federation and the other groups in a separate, 29-page filing also late Monday asked that the federal government be ordered to spill more water in the spring over the dams at the four Snake River hydropower projects and four more on the Columbia River to help migrating salmon. A federal judge ruled in May that the U.S. government has not done enough to improve northwest salmon runs and ordered an environmental impact statement that is due out in 2021, urging officials to consider removing the dams. The environmental groups contend that infrastructure improvements should not be allowed at the projects during the review. "These kinds of investments should be suspended to ensure a level playing field for all of the alternatives agencies must consider, including the alternative of lower Snake River dam removal," Kevin Lewis of Idaho Rivers United said in a statement. The review process is being conducted under the National Environmental Policy Act, or NEPA, an umbrella law that covers the Endangered Species Act. Thirteen species of salmon and steelhead on the Columbia and Snake rivers have been listed as federally protected over the past 25 years. Four of the listed species are found in Idaho. Dams cited in the documents pertaining to the Snake River hydropower projects include the impoundment structure at the 603-MW Ice Harbor, 810-MW Lower Monumental, 810-MW Little Goose and 810-MW Lower Granite. These dams are the four lowest downstream on the 1,000-mile-long Snake River, itself a tributary to the Columbia River. The four dams are managed by the U.S. Army Corps of Engineers and were built in the 1960s and 1970s. According to the Associated Press, Corps officials did not return a call for more information. Northwest River Partners, which represents a coalition of businesses and river users and has intervened on the side of the federal government, is against removing the dams. "We need to keep investing in critical infrastructure like the Snake River dams," said Terry Flores, director of the Portland-based group. "We need to keep them well maintained so we can keep the lights on and keep people safe and warm, and the economy running." The $110 million listed in the document filed Monday is an estimate by the environmental groups and said the Corps declined to provide precise numbers. The groups say more than half of the money is being spent on Ice Harbor Dam and includes new turbine blades. In March 2016 for the Ice Harbor project, the Corps awarded Voith Hydro a $47,671,170 contract to install a fixed-blade Kaplan runner on Ice Harbor's Unit 2 and adjustable Kaplan runners in Units 1 and 3. The company also replaced other major steel components, rewind generators, and supplied one stator core and three stator windings. In May 2015, the Corps awarded a $12,973,090 contract to Andritz Hydro for generator rewinds and turbine cavitation repairs at the Lower Monumental hydroelectric plant in Washington. 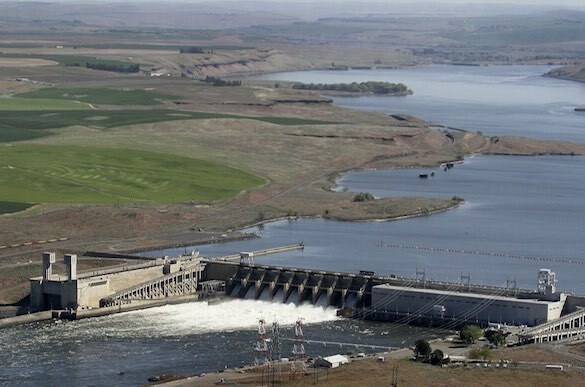 "The Corps is continuing to commit major capital resources to restoring and extending the useful life of the four lower Snake River dams without hesitation or pause," the court document states. The groups say the expenditures could be used to argue the dams should not be removed.